Reserve seasoning packet from noodles. Cook and drain noodles as directed on package. While noodles are cooking, heat olive oil in wok or 12-inch skillet over high heat. Add asparagus, bell pepper, onion and garlic; stir-fry 2 to 3 minutes or until vegetables are crisp-tender. Add scallops; stir-fry until white. 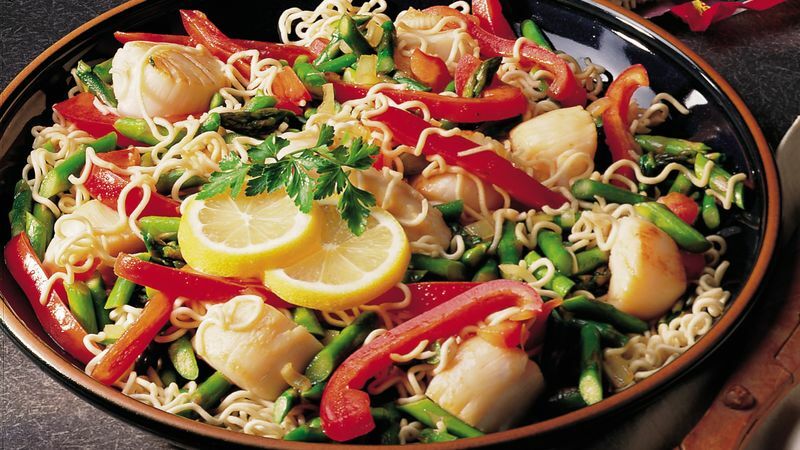 Mix contents of seasoning packet, soy sauce, lemon juice, sesame oil and pepper sauce; stir into scallops mixture. Stir in noodles; heat through. Bay scallops, which are about 1/2 inch in diameter, can be substituted for the sea scallops. Scallops are generally classified as either bay or sea scallops. Bay scallops are much smaller and sweeter than their counterparts. Sea scallops are more readily available and less expensive than bay scallops. Cook scallops just until white in the center to keep them the most tender. Fresh-squeezed lemon juice offers a tangy complement to the tender scallops. Garnish plates with lemon slices that have been cut just to the center and then twisted. Enjoy with a glass of dry white wine.